1 What are pistachios good for? Pistachios are a very caloric food. Since they contain a lot of calories, they are a great source of energy. As a nut, pistachio contains very little water, reason why its nutrients are more concentrated and therefore is much more nutritious. Pistachios are a very nutritious food because they provide lots of nutrients such as fat, good quality healthy proteins, mostly complex carbohydrates, antioxidant vitamins, minerals and other important nutrients very beneficial for our health. If we add the amount of polyunsaturated fats and monounsaturated fats containing, they have more than 80% of its content in unsaturated fat that is beneficial to health. Considering the quality of fat, it is similar to olive oil because more than 50% of its content is oleic acid, a very healthy monounsaturated fat, which is known because of its protective effect on arteries. Oleic acid prevent cardiovascular and coronary diseases such as arteriosclerosis by preventing cholesterol to deposit and accumulate in the vessels, something that can obstruct them causing thrombosis. Pistachio also contains a big part, about 30%, of polyunsaturated fat, mostly as linoleic acid. Linoleic acid is an essential fatty acid from the omega 6 family. It also contains small amounts of other fatty acid called linolenic acid, which is an essential fatty acid of omega-3 family. Its saturated fat content is low. It usually slightly covers 10% of the total fat. Being of plant origin, pistachios do not contain cholesterol. Whereupon, they are considered very beneficial and healthy, because a healthy diet should give preference to the quality of fats. Therefore, consuming a handful of shelled pistachios and other nuts, about 3-4 times a week, gives us numerous benefits, preventing the risk of multiple diseases. 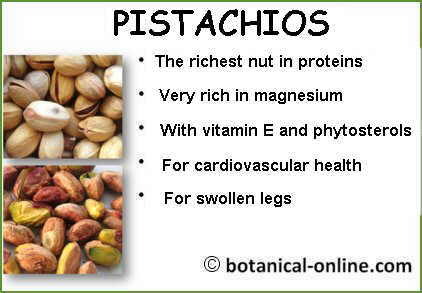 Some of the nutritional characteristics and properties of pistachios. See “Pistachio food ” in detail. They have a high amount of protein. It contains more protein than almonds, chestnuts, hazelnuts, walnuts, Brazil nuts, cashews, pine nuts, poppy or sesame. However, less protein than other nuts such as lupins, peanuts (it is a legume), sunflower seeds and flax seeds. If we want to enhance or increase the amount of protein in our diet, we must choose preferably, not exclusively, those nuts that are rich in protein. Proteins are very important for our body to form muscles and tissues. Tissues make up the organs, therefore, we must provide the amount of protein needed to ensure proper operation and maintenance of such important organs as the heart or the brain and its connections. But proteins are not only for the proper functioning of organs, they are also needed to have good defenses to produce substances such as enzymes and hormones, and to carry oxygen through the blood to all cells. Pistachios are high in carbohydrates, with amounts ranging about 28% of total food, they are mostly complex carbohydrates, wherereas only 7% are simple carbohidrates, that is to say, rapidly absorbed sugars that provide immediate energy. Complex carbohydrates are slowly absorbed, so they do not create sudden increases in levels of blood sugar. Whereupon they are beneficial for diabetes diet because they allow to maintain blood sugar levels and insulin in the blood constant, which prevents negative consequences for health. 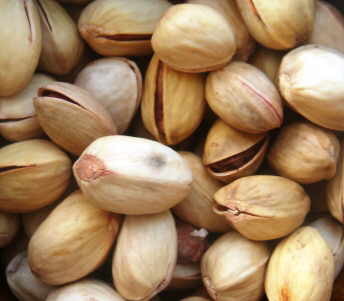 Pistachios are rich in fiber exceeding 10 %. They have two types of fiber: soluble fiber and insoluble fiber. Fiber also increases satiety and fullness so it can help lose weight to people who are hungry and suffer overweight or obesity . In case of diarrhea, fiber acts as a thickening. One of the greatest benefits of fiber is its prebiotic effect, That is to say, it stimulates the growth of some bacteria that protect us, maintain our defenses and promote our health. Relating to insoluble fiber, it is beneficial for overweight or obese people, since it increases intestinal transit. which causes a decrease in the absorption of ingested carbohydrates, fat and cholesterol.